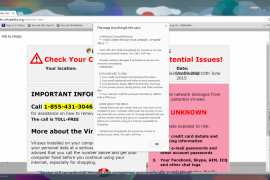 One of the primary symptoms of this type of adware is that they may affect the PC’s performance, mainly the RAM. Også, Security Help Page pop ups may turn into a threat if the user decides to call the numbers displayed. The user might be transferred to a cyber crook who could be with some experience in the social engineering technique. Dermed, inexperienced users may be tricked into giving away their banking credentials.